Irene 5H Hugger Fan - Black | 52"
Other Size & Finish Options Textured bronze | 42" Textured bronze | 52" Chrome | 42" Chrome | 52" Brushed Nickel | 42" Brushed Nickel | 52" Black | 42" White | 42" White | 52"
The Irene 5H hugger style ceiling fan by Matthews Fan Company is a unique blend of contemporary and rustic. 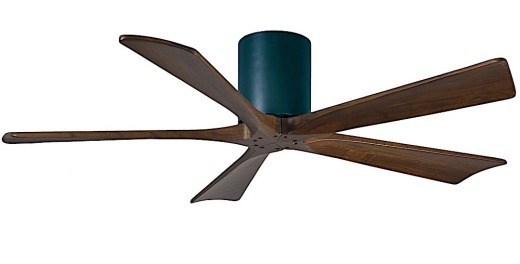 The rodless ceiling fan features a cylinder motor housing and five neatly joined solid walnut-stained wood blades. An ultra quiet, six speed motor let's you stay cool in style. Created from cast aluminum and heavy stamped steel. This fan includes a wall mountable handheld remote with reverse on the remote. Available in black, white, brushed nickel, chrome or textured bronze finishes, and with 42" or 52" blades. Housing is 7" in diameter.